First of all, before we get to any predictions, can we take a moment to imagine the World Series that never was? I’m talking about 1980, when the two most exciting teams of my childhood came within a couple Del Unser base hits from meeting in what would have been a blazing festival of speed. In 1980 the Astros and Royals both led their leagues in triples and amassed a combined 379 stolen bases. Nothing against the long-suffering Phillies, whose first-ever World Series triumph that year clinches that season of end-to-end thrills as one of the greatest ever (in Benchwarmer I describe how for several feverish weeks during the panicked early days of fatherhood I grasped for sanity by imagining penning a Pulitzer-worthy Halberstamian ode to 1980 to be titled The Highest Season: Racing for the Pennant, Chasing .400, Philly Soul, Super Joe, and Blow), but some part of me mourns the loss of a World Series that would have been an exhilarating blur of rainbow and sky-blue racers. There’s a decidedly muted version of the excitement of the Royals and Astros of that era in the two cards shown here. 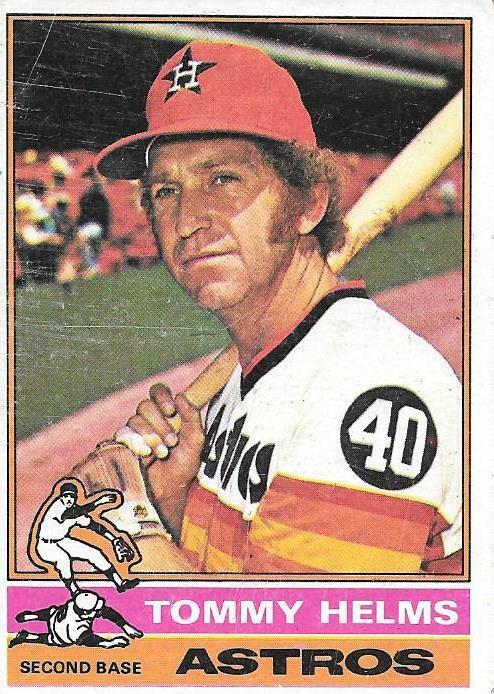 With Tommy Helms, the excitement is embedded in the uniform, which seemed altogether of a piece with Jose Cruz smashing a liner into the gap and flying around the bases but that seems a bit at odds with the worldly resolve in Tommy Helms’s creased expression. His perm somehow also cuts against the grain of the space-age threads; both are wholly of their era, of course, but the hairstyle seems to point away from the action on the diamond to a time in the near future when Tommy Helms is going to be out of baseball altogether and renting you a canoe. 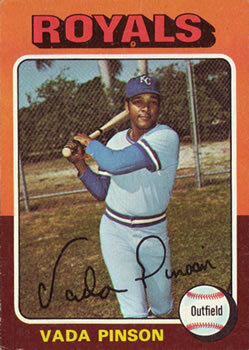 Helms’s erstwhile Reds teammate, Vada Pinson, presents his own muted version of excitement by predating the Royals heyday slightly while also being in the twilight of his own career, which at its pinnacle showcased dynamic talents that would have fit in perfectly with the dynastic Royals. He could have been the prototypical Royal—imagine swift, impeccable fielding coupled with 200 slashing hits a year, doubles, triples, homers, steals, Amos Otis and George Brett somehow joined in the version of Vada Pinson suggested by the statistics of his early years—had he only been able to carry his youth with him into the professional athlete’s version of old age. Of course, both of the wizened veterans here are, in real-world terms, still young men. But in sports the end comes earlier and as such begins to loom not that long before the beginning. Just as my cards suggested that the other ALDS series is about beginnings, the cards here seem to imply that the series at hand is about endings. So which of the estimable 1960s Reds shown here is venturing more gracefully toward the end? Tommy Helms will make it OK to the other side, surely, and will hobble on through the rest of his life just fine, but Vada Pinson seems like he’ll be able to bring with him across that border into our leaden everyday life a small, singing note of buoyancy and repose. We all hope to continue on that way somehow. You are currently browsing the archives for the Vada Pinson category.